The arbitrary arrest and detention of Jeyakumari Balendran in April this year, can be perceived as an attempt to cause fear among victims of the war who have not had any relief from the State and may wish to take their cause before the UN Inquiry, the National Peace Council (NPC) said today. Pointing out her arrest has intimidated local Human Rights Defenders (HRDs) due to the chilling message it has sent across – that their activism may be punished, the NPC in a statement issued to mark the International Day of Victims of Enforced Disappearances that fell on August 30, the NPC has shed light on Jeyakumari – a campaigner for those who went missing during the war- who is yet detained, separated from her 13 year-old daughter. The NPC notes that her arrest has also raised concerns over manipulating the PTA to target and take arbitrary punitive action against those who speak out on behalf of those who went missing during the war. While recalling the Army Spokesperson’s statement where he claimed that Jeyakumari was arrested for habouring an armed criminal wanted in connection with an ongoing investigation, the NPC states that to their knowledge, no credible evidence has been produced by the government to substantiate the allegations against her to determine that she was in any way involved in aiding and abetting the LTTE revivalists. 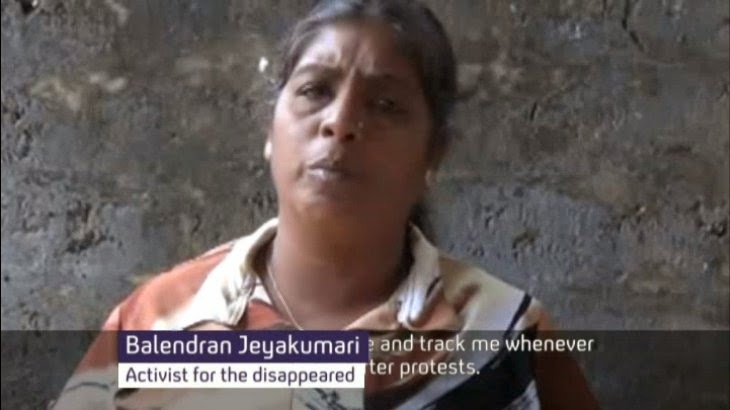 The organisation has pointed out that indefinite detention without charges gives rise to the reasonable suspicion that Jeyakumari is being penalised, deprived of her fundamental rights for speaking out on behalf of families who are seeking whereabouts of their loved ones who are missing. They have also expressed concern for Jeyakumari’s mental wellbeing and physical safety against the backdrop of mounting allegations of torture that are being made against law enforcement officials. Furthermore in the statement the NPC has called upon the National Human Rights Commission to probe into Jeyakumari’s case and other similar cases where persons have been detained under the PTA without being brought to trial. “We also believe that the abuse of the PTA to detain persons to intimidate and silence them highlights the need for its repeal and re-affirms the citizen’s right to speak out and campaign for human rights and justice,” it adds. Previously this year in March, several other HRDs were arrested and some of them were released following unrelenting international and local protests calling for their release.